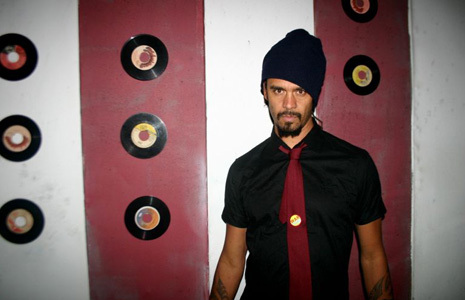 CALIFORNIAN poet, musician and composer Michael Franti is scheduled to be first on the main stage at Weston Park on Sunday. His new album, the Sly and Robbie-produced All Rebel Rockers, blends hip hop, funk and reggae - and doesn't hold back on Franti's outspoken views on peace and social justice. We caught up with him as he prepared for the V Festival. Q How do you feel about being the opening act on the main stage at this weekend's V Festival? A I feel lucky, I feel grateful! There are a million bands that are lucky to get a gig at local pub. We also take it as a bit of a challenge to put on a great show so that every band that follows Spearhead will say holy sh*t! and they will have to put their heart into their show. What can V Festival goers expect from your set? We are playing lots of new song off the new album and we will play some classic Spearhead. We never really know what our set's gonna be until a half hour before we go on. Expect to dance and get ready to sweat! Do you have time to check out other bands at festivals? My favourite part of going to festivals is that it 's a rare opportunity for me to check out other bands. I just walk around the festival and I always stumble on something cool... and it's rarely on the main stage. What was it like working with Sly and Robbie? Working with Sly and Robbie is like going to Harvard or Oxford or Cambridge University of Riddim. Which particular incidents or events inspired the songs on All Rebel Rockers? Well, right now the world is in a multi-crisis. Cost of fuel, the war in Iraq, global climate change, food shortage and the cost of a spliff has gone up! So I wanted to make a record that encourages people to stay positive during difficult times. Bearing in mind the recent fighting between Russia and Georgia and the continuing conflicts in Iraq and Afghanistan do you ever despair that your calls for world peace are falling on deaf ears? Whenever I feel frustrated about an issue, instead of just talking about it, I go to it. So, instead of just speaking out against the war in Iraq, I went to sing in the streets of Baghdad and looked into the eyes of Iraqi families who wanted peace more than anything else. Then I visited and looked into the eyes of US soldiers who more than anything else wanted to go home. This gave me optimism in that I'm not alone in wanting to see an end to political violence everywhere. Birmingham reggae bands Steel Pulse and UB40 are worldwide successes. Were you influenced by either act? Yes - I love both of them. A few years ago I rapped on a Steel Pulse song and I recorded in UB40's studio in Jamaica. I know both bands have done a lot of good work in the community and I respect that.